Stéphane Dénève, the new principal conductor of the Stuttgart Radio Symphony Orchestra of SWR, makes his debut recording with a thoughtful and exceptionally well-balanced program of music by the French composer Francis Poulenc. As has been said many times before, Poulenc was both a monk and a rascal; deeply religious one hand, while enjoying celebrity and flamboyant lifestyle on the other. These two sides of his personality are beautifully represented in the program of this CD. First off, there is the enchantingly frivolous ballet “Les Biches,” written in 1924 for Serge Diaghilev and the Ballets Russes. For this recording, Denève performs the full version, including the three tableaux with chorus. Poulenc’s spiritual side is represented by the “requiem” he composed for the painter Christian Bérard – on the text of the Stabat Mater, a medieval hymn meditating on the suffering of Mary during Christ’s crucifixion. 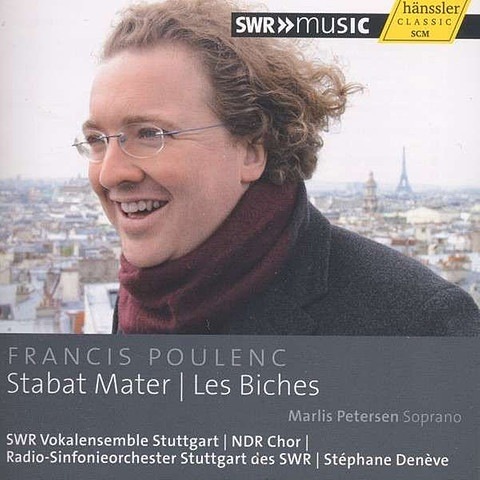 Scored for soprano, chorus and orchestra Poulenc’s hauntingly passionate Stabat Mater is widely considered one of the greatest sacred choral works of the 20th century.